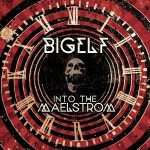 Share the post "Album review: BIGELF – Into The Maelstrom"
Inside Out – Out Now. Back in 2010, Prog Metal’s finest band Dream Theater went on the road in support of their then latest album “Black Clouds & Silver Linings” and with them brought us as an opening act the Psychedelic/Progressive Rock quartet Bigelf. It did not take long for the attending audiences to warm to the sounds of this unusual outfit but, sadly, friction amongst the members of the band’s then line up ensured that the interest and healthy momentum built as a result of this tour was lost. Well, you cannot keep a good band down, and it was, interestingly enough, through the urging and involvement of one Mike Portnoy (ex-Dream Theater) that Bigelf’s leading figure Damon Fox (vocals/keys) decided to put this band back into action and thank God he did, as the resulting album “Into The Maelstorm” is a truly magnificent effort. The biggest strength of this band is its ability to create compositions that are ridiculously structured and thematically varied but which are, somehow, fairly easy to digest and relate to. Focusing predominantly on Fox’s Bowie/Supertramp sounding vocals and heavily indebted to his 70s-inspired keyboard prowess, the twelve new compositions provide an insane variety of moods and traverse all of Rock’s musical landscapes known to man. At their softest and more melodic, they look towards bands like The Beatles for inspiration but every time these spacey keyboards, melodic lead guitars and unusual time signatures kick in, it is bands like Hawkwind, Pink Floyd and Yes that first spring to mind – surely a dream in the making for every Prog Rock fan. This much welcome musical madness is perfectly manifested in the opening composition “Incredible Time Machine” – a true celebration of all things extravagant and flamboyant. This album is not, however, only about weird layered vocals and futuristic keys. Based on a groovy massive-sounding riff, “Hypersleep” proves that Bigelf can groove just as well as the next Stoner Rock band, while “Already Gone” brings things closer to a “Ziggy Stardust” David Bowie territory. “Alien Frequency” is the first song to truly capture my imagination as every different element in it, and believe me there are many, is perfectly balanced and well-calculated and showcases Bigelf’s compositional ingenuity. More structural rules are confidently bent in the sitar-infused “The Professor And The Madman” while “Mr. Harry McQuhae” is another ridiculously ambitious and massively inspiring moody composition. Plenty of the band’s swagger and attitude is audible in “Vertigod” and “Control Freak” while the seven minute high contains, apart from beautifully crafted 70s keyboard tunes, the most insanely catchy refrains of the album. “Edge Of Oblivion” is, through the strength of its variety, a pure Rock Opera material, “Theater Of Dreams” the vocal-led tune that The Beatles forgot to write while the eight minute “ITM” provides the members of Bigelf with the last opportunity to impress you with their technical/compositional ingenuity, something that they take real advantage of. It is a great shame that Bigelf did not manage to realise the interest generated by their involvement with Dream Theater four years ago but perhaps it is as a result of all the upheavals that Damon Fox had to deal with these last few years that we are now in position to enjoy an album of the energy, urgency and attitude of “Into The Maelstorm”. It takes a pretty charismatic group of artists to create an album of suchquality and stature and we all know that, in this day and age, this is the exception rather than the norm so get yourselves a copy of this impressive release, sit back and enjoy the ride! This entry was posted in ALBUM REVIEWS, PURE METAL (All posts), Pure Metal/Album reviews and tagged album, Bigelf, Into The Maelstrom, progressive metal, review, rock. Bookmark the permalink.